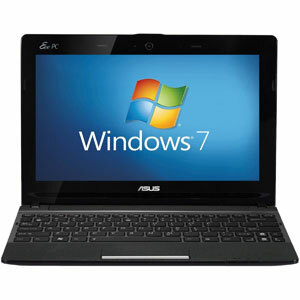 The Asus Eee is the ideal netbook/laptop for the VAGCOM system, it is small, lightweight and most importantly, it uses Windows for its operating system. As the Asus Eee is so slim and lightweight (under 1 inch thick) you can easily carry it within the car to diagnose those intermittent faults. The Intel Atom 1.6 GHz processor may not be powerful enough to run the latest games but is perfect for any car diagnostics and can even be used for web browsing to research the cost of replacement parts or other people experiencing similar problems. The Asus Eee features ‘instant on’ so it can return to Windows 7 from sleep mode in under two seconds, which makes it an ideal tool to use in the garage. The Asus Eee can also remain on standby for up to a week before the battery will need recharging and can remain turned on and in use for 3 – 5 hours, which is more than enough time to diagnose any problems you are having. The 10.1 inch screen allows the netbook to remain light and portable and the 1024 X 600 resolution means the images will always be crystal clear. The screen also has a bright matt finish which makes using it outside in the sun far easier due to less glare on the screen. The Asus Eee supports HDMI so you can also easily output video onto your HDTV. The fanless design means complete silence during operation, while remaining cool. The 320GB hard drive provides a huge amount of data storage and is more than enough to save any car diagnostics software along with workshop manuals, pictures, HD videos and even your music collection, so you can have music while you solve problems with your vehicle. Another benefit of the Asus Eee is that it comes preloaded with the asus@vibe store which comes filled with cloud computing content. Asus@vibe uses the Asus Eee’s super-fast WIFI connection to download content from the cloud so your storage is not being used. Unlike tablet devices the Asus Eee comes with a physical keyboard and this has some surprising benefits, most touch screen devices rely on the heat of the fingers so if it’s very cold in your workshop or you wear gloves your expensive touch screen device becomes useless. Oil, grease and dirt will end up on your hands if you’re working on a car, it’s inevitable, touch screen devices lose their appeal when smeared with grease. Some people find netbooks a little on the slow side, opting instead for large desktop computers, however the Asus Eee features Ready Boost, this allows you to improve the system performance by using an SD card as temporary super-fast RAM like storage. Another criticism of netbooks is that there is no CD drive, the Perfect VAGCOM computer package includes a slim external DVD reader / writer so you can even watch your latest DVDs and burn all your diagnostic results to a DVD.